Good stay, had a private room on top floor. Nice view of Bondi Beach, basic room but all we needed, had sink and rail. NOT impressed with the bathrooms, you couldn’t get into the toilets without sliding up against the wall & door, they were far too small! There were only 2 showers & 2 toilets for a whole floor of dorm rooms and double rooms! One night I waited in a queue for half an hour just for a shower! There were soap dispensers but no soap the whole weekend, even after requesting, gross! Great location! 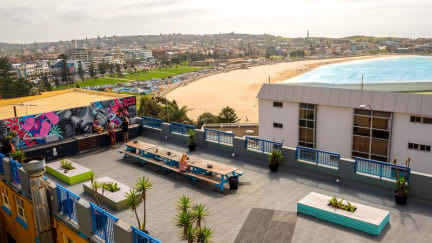 You can see Bondi Beach from the rooftop which means both the beach and bondi icebergs are walking distance! There’s loads of nice cafes around as well! The staff are really friendly and helpful! However, the bathrooms aren’t very good at all... the water temperature is constantly changing from boiling to freezing, and they never seem that clean! Also the WiFi is bad, you keep having to go and get new WiFi codes. Overall though really happy with this hostel fully recommended! 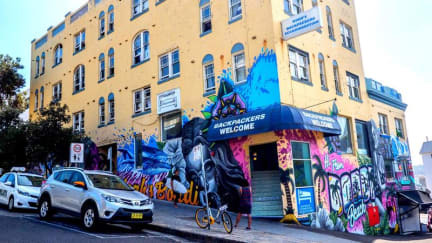 Location is good for both the beach but getting in and around Sydney as the bus stop is right outside the hostel. Kitchen is small and with limited utensils so during busy periods it can take a while to get a chance to get a hob and cook. Hostel is a very social hostel and met lots of people here. Would recommend as is relatively cheap for the location you’re getting. Good for the young backpacker, but not for my age group. Rooms were very warm, showers were not great. Amazing location for a hostel but very expensive for what you actually get. The showers aren't great and the beds were very uncomfortable and mine didn't even have a pillow. Apart from that though it's a 5 min walk to beach and swimming pool so that makes up for it. Walking into a very messy room that also smelt very bad wasn’t a great start! you can’t move in the toilet otherwise the separation walls would be moved out of place, no doors to lock for the shower either which I felt uncomfortable about. Nice outside rooftop area, comfy tv area and good location, but wouldn’t stay again. The staff at the front desk are incredibly friendly and informative. We really felt like we learnt a lot about the surrounding area and things to do! The rooms were okay - not the best but okay. We booked a private room and the worst thing from the whole trip was the bathrooms. After a heavy night drinking from Friday someone had clearly thrown up on the toilet and around the toilet - this was still here when we left Sunday. The showers are also pretty basic and with barely any privacy. We think they never clean out the rooms. We had room 101 and it was so disgusting. It smelled really bad and it was so crowded with stuff that belonged to nobody. The kitchen always has a weird smell of fish and there is no place at all to cook. Honestly one of the worst hostels out there! Sad to say that. Almost everything was dated or damaged. Toilet doors didn't close. Bathroom had mould everywhere that wasn't tiled.